The dynamic duo you'll use again and again. Few pieces of kitchen gear improve after years of heavy use. In fact, we could think of only one: the cast-iron pan. As you cook in it, a cast-iron pan gradually takes on a slick natural patina that releases food easily. Well-seasoned cast iron can rival, and certainly outlast, a nonstick pan; it’s virtually indestructible and easily restored if mistreated. 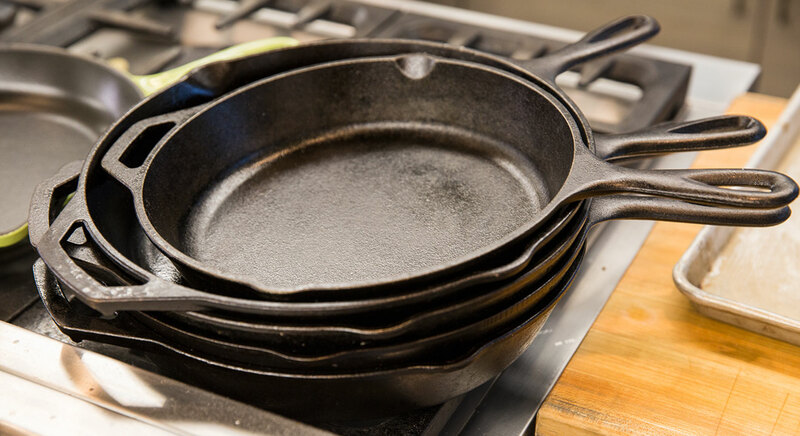 Cast iron’s special talent is heat retention, which makes it ideal for browning, searing, and shallow frying. Our longtime favorite wins test after test, and the tempered glass lid from the same manufacturer traps the heat, fits snugly, and lets you see what’s happening as you cook. Diameter: 12" Depth: 2.25" Weight: 7lbs, 10⅛oz Handle: 4.75" Cooking Surface Diameter: 10"
This lightweight lid helped produce nicely browned onions and evenly cooked eggs, and it was much easier to lift and clean than the heavy cast-iron lid. It contained moisture and messes, and its glass material allowed users to get a good sense of how their food was cooking. 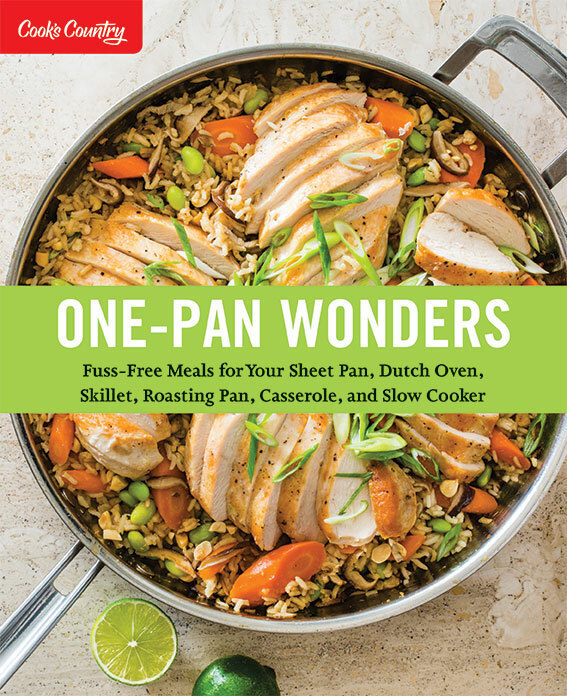 138 Fuss-Free Meals for Your Sheet Pan, Dutch Oven, Skillet, Roasting Pan, Casserole, and Slow Cooker. We tested both traditional and enameled cast-iron pans (the latter have a coating of enamel over the cast iron). We scrambled eggs, seared steaks, made a tomato-caper pan sauce (to check if its acidity reacted with the pan surface), skillet-roasted thick fish fillets that went from stove to oven, baked cornbread, and shallow-fried breaded chicken cutlets. At the end of testing, we scrambled more eggs to see whether the pans’ surfaces had evolved. To simulate years of kitchen use, we plunged hot pans into ice water, banged a metal spoon on their rims, cut in them with a chef’s knife, and scraped them with a metal spoon. 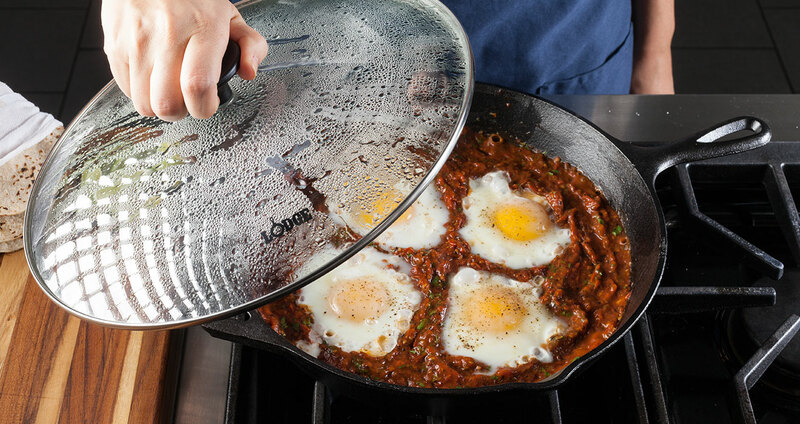 We purchased two dedicated cast-iron skillet lids from Lodge, one made of cast iron and one made of tempered glass. We used them to cover skillets filled with frying eggs and caramelizing onions, evaluating how thoroughly they retained heat and dispersed condensation and thus how evenly and thoroughly the foods cooked. Then we assessed how well they contained messes, covering skillets full of simmering tomato sauce and observing the extent to which the stove and counter got spattered. Finally, we looked at how easy the lids were to clean, washing each by hand. As per Lodge’s recommendation, we also dried and oiled the cast-iron lid after every use.